Spring is upon us, and it’s time to start preparing your landscape to ensure it’s ready to look its best all season! With the last of the winter freezes behind us, we can finally start to get excited about the changing scenery once more. As the trees begin to sprout their first buds, take these four steps to ensure your landscape is ready to bloom. The effects of winter can have a significant impact on your landscaping, one of the first steps you should take is to check for and repair damage. 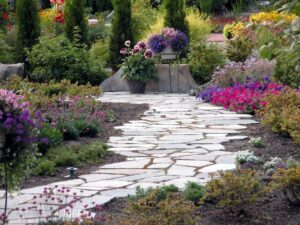 Hardscaping and water features, in particular, are at risk over the winter due to the freeze and thaw cycles and the corrosive effects of road salt. Additionally, fences can be damaged by winter storms, errant plows, and heavy snows. Do a thorough check of your property to look for signs of damage and ensure that any issues are dealt with quickly. Over winter the last of the leaves likely fell into your property, and along with any blown in sticks, debris, and rubbish, it’s more than likely that your property and gardens need some serious cleanup. Taking the time to clean up lawns and garden beds will help prepare the grounds for a fresh layer of much as well as allowing your lawn to breath and get ready to work on new growth. Adding mulch to your garden beds is a step that helps improve their looks but also helps to keep plants healthy and weeds at bay. When you add a thick layer of mulch, it helps to keep the soil temperature and moisture levels consistent, which is critical for maintaining plant health during the hot, dry summer. Having your irrigation system ready to go is an essential part of ensuring your landscape is ready for spring. Once the ground has thawed at least a foot deep, you can begin checking on your system. Often, it’s most useful to have a professional perform your annual irrigation check-up, but you will want to keep an eye out for wear and tear, broken nozzles, obstructions, and water pressure fluctuations. This entry was posted on Friday, April 5th, 2019	at 5:04 pm	and is filed under Landscaping Maintenance	. You can follow any responses to this entry through the RSS 2.0	feed. Both comments and pings are currently closed.